Frank Olivier returns for his 10th Year to Moisture Festival. 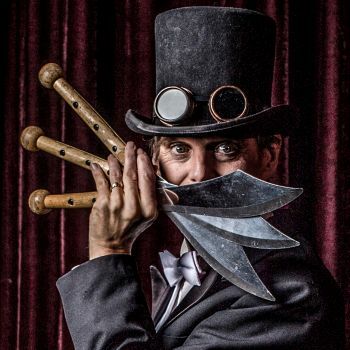 His own show “Twisted Cabaret” plays Hale’s Palladium each year for the month of February. Frank developed his unique offbeat humor in San Francisco’s comedy clubs. He was soon sharing the bill with Dana Carvey, Robin Williams, Whoopi Goldberg, and others. New York producers spotted his talents, and quickly signed him. He performed his act for the next three years in the Broadway hit show ‘Sugar Babies’.Olivier’s act has been seen on The Tonight Show, America’s Got Talent, Ellen, The Late Late Show, Last Comic Standing, HBO’s Just For Laughs, and over a hundred more. He’s also headlined Las Vegas, comedy and theater festivals, and performs countless corporate shows for companies like Apple, Intel, Wells Fargo, Chevron, Gap Inc., Morgan Stanley and more. In 1975, as a self taught 12 year old juggler he became most excited when a circus tent went up in his neighborhood. This group had the whiff of counterculture about them and Frank and his friends rode their bikes to the show every single day and … well, frankly, he caught something. The group was headed up by Major Chumleigh and included an act called The Flaming Zucchini. The boys were thrilled when they came to the realization that those two characters were, in fact the same mad man, Michael Mielnik (later known to the world as the legendary Reverend Chumleigh). Chumleigh (to his personal shame) had inspired a young boy to turn to a life of juggling. While the straight world lost whatever contribution that young man might have made, the performance world gained one of the funniest juggling acts to ever play a flaming guitar on top of a tall unicycle.